Gorse fires on England's most southerly point are thought to have been started deliberately, firefighters say. Cornwall Fire and Rescue Service was first called to the Lizard Peninsula on Monday night, returning to extinguish further blazes on Goonhilly Downs on Tuesday evening. The latest fires led to a road near Mullion Holiday Park being closed. The brigade tweeted that the "large majority" of gorse fires in the area were suspicious. 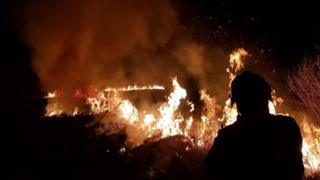 Crews from five Cornwall stations were involved in tackling the blazes, which were extinguished by 21:15 GMT. Three blazes in the area in November were also thought to have been started deliberately.